We believe that our success is based on an untiring quest for quality and exclusivity, coupled with a desire to create employment, enhance living standards of the local community and develop mutually beneficial partnerships with all stakeholders. The sturdy-rooted Acacia Albida tree is widespread in semi-arid Africa and revered in most parts of the continent. The hand-sketched tree in our logo represents stability, nurturing, prosperity and, above all, our commitment to being a fair, principled and responsible player in our physical, social and business spheres of influence. The colours are reminiscent of brilliant sunsets in the Zambezi Valley where this tree flourishes, with the sketchy artwork suggesting an approach respectful of every venture’s individuality. Ross, who has been at the helm of hospitality group Africa Albida Tourism (AAT) since its very beginnings a quarter of a century ago, is also a leading figure in Zimbabwe’s tourism industry. 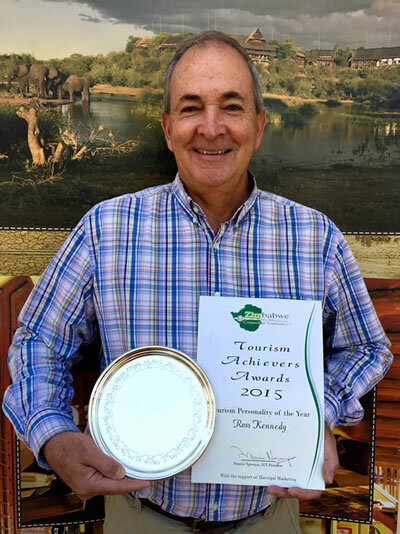 The recipient of numerous accolades, Ross’s outstanding contribution to the growth and development of Zimbabwe’s travel and tourism sector was recognized when he was awarded the Tourism Personality of the Year Award by the Zimbabwe Council for Tourism. Ross is an Honorary Fellow of the African Travel and Tourism Association (ATTA), after retiring as Chairman in 2017, at the end of his term. ATTA is an organisation that promotes tourism to Africa from all corners of the world and is recognised as the voice of African Tourism. Ross was the first Africa-based chairman in the history of ATTA. Ross is also a Fellow of the Institute of Travel & Tourism, a member of the Institute of Hospitality, a founder, and trustee, of the Victoria Falls Anti-Poaching Unit, Tourism Entrepreneur of The Year 2008 for Oustanding Contribution to Tourism Development, awarded by World Tourism Organisation/Zimbabwe Tourism Authority. He sits on advisory panels for the Minister of Tourism and Hospitality Industry. He also works closely with the Civil Aviation Authority of Zimbabwe to market the new International airport in Victoria Falls, to bring new airlines, and encourage existing airlines to fly larger aircraft on the route. This exercise is ongoing and has so far been successful. Ross often features in magazine and newspaper articles, both in Zimbabwe and internationally, speaking on current issues relevant to the destination. Born in Bulawayo and educated in Harare, Ross grew up in a family involved in mining, irrigation, and ranching in Bulawayo and Filabusi, in Matebeleland South, in the 1950s and 1960s. His older brother decided to become a hotelier, and Ross followed suit. He learned his trade at South Devon Technical College in England, before beginning his career at the Jameson Hotel in Harare, and going on to operate hotels, pubs, and restaurants in the United Kingdom, with his wife Karen, and brother and family. It was during this time that an old friend, Dave Glynn, AAT Chairman, called to say he had found a piece of land for a possible development in Victoria Falls, and invited Ross and Karen to be become involved as the hoteliers in the project. Ross and Karen jumped at the opportunity to return home, and the rest is history. While Ross puts enormous energy into his professional life, he is also very much a family man, with four adult children, and five grandchildren.